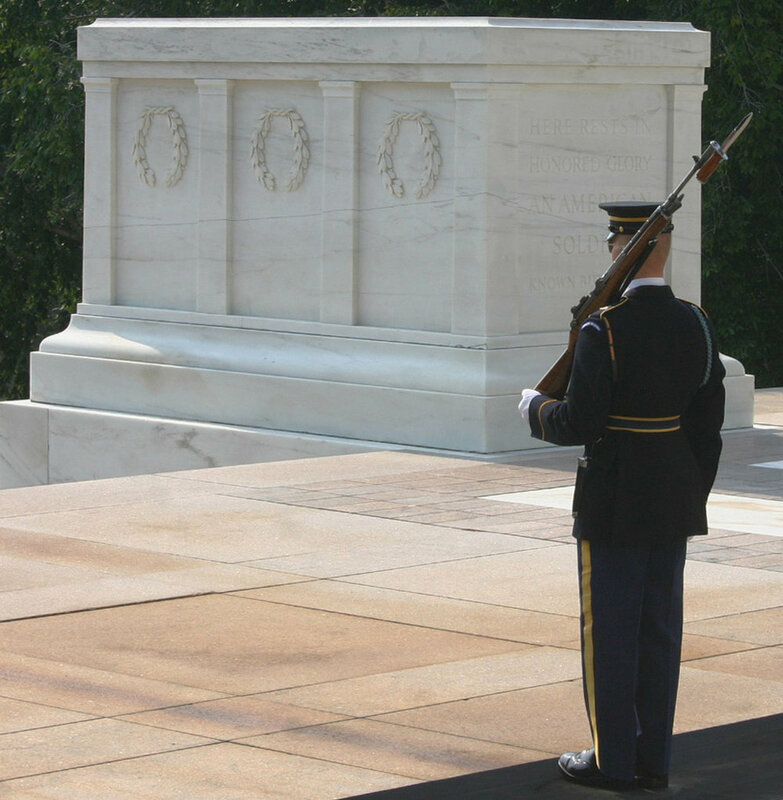 At the Tomb of the Unknown Soldier at Arlington Cemetery, a Sentinel walks the mat 24-hours a day, seven days a week. In this episode, we move beyond superstition, but look deeper at the kind of repetition that can echo across generations. I introduce you to an essayist from Wyoming with a knack for tradition and a past life as a guard that feels very present. Okay, so these shownotes are going to focus on just the American Tomb of the Unknown Soldier, just like the episode did. But you should know that many different countries memorialize their war dead with a Tomb of the Unknown of their own. Let’s start with some nice general background information. If you want a good overview of just the American tomb, here’s a link to more info on that. This PBS article discusses the selection of the WWI unknown, and also has a great video of the Changing of the Guard, so you can actually see everything you heard Dan talking about in the episode. As always, whenever it’s possible I like to provide information straight from the source. The Arlington website is a great source for information on the Tomb. I also encourage you to look through the website at all of the other incredible monuments. If you can get out there to visit in person, I cannot encourage you more to go and check it out. It’s an incredibly moving piece of American history. The Society of the Honor Guard is the official society of former Tomb guards, but their website also has a lot of interesting information on the guards, even for the uninitiated. This is the white marble sarcophagus of the memorial. The graves of the unknowns are directly in front of it, and the steps where visitors can sit are right where the photographer was standing when he or she took this photograph. An aerial view of the dedication of the Tomb and the interment of the WWI unknown. The whole story of how the Vietnam Unknown was reclaimed is extremely interesting, and I’d advise anybody whose curiosity was piqued to look further into it. This Washington Post article walks you chronologically through the story and does a good job of conveying the controversy that surrounded the ordeal. Also, this article from the Atlantic discusses the meaning of the Tomb in the light of the fact that there will probably never again be an Unknown soldier. It came out literally the week before this episode was released, so I’m feeling hella relevant right now. To me, that really adds to the temporality of the whole thing. This is a monument that didn’t need to be created prior to WWI, and now, one hundred years later, it’s impossible to honestly create. It is absolutely a product of its time. The wreath laying ceremony is an integral part of the Tomb's function, serving as an opportunity for world leaders to pay their respects to the American fallen. This photo shows a wreath ceremony from 1947. Dan Stewart uses his free time in a deeply productive way, namely, researching and writing fascinating papers. He recently finished a paper on Chief Plenty Coups and the role of American Indians in the role of the interment of the unknown soldier. I want to clarify one comment I made about the guards wearing rank. When I spoke to Dan about the episode after we recorded it, he wanted me to double check that fact. So I called Arlington Cemetery and the Old Guard. Turns out, the commander of the relief does wear rank insignia, but the soldier walking the mat does not. The question of who wears rank insignia is further discussed in this article, which is also a great discussion about the honor guard in general. Also, a little more information about that crack. This article from the Denver Post gives a good overview of the history of trying to replace the marble. The marble is mined in Colorado, so the article pays special attention to the perspective of the quarry. If you’re looking for something that’s a little more academic, you’re going to find an interesting combination of historical and artistic analysis. Obviously, it’s hard to really understand the Tomb of the Unknowns without understand how different WWI was from prior conflicts. That being said, the Tomb of the Unknowns is fascinating to analyze from an art historical angle as well. You’ve got the invocation of the Roman Empire through the choice of monument, but from a less referential angle, just a discussion of the materiality of the human body is fascinating. If you’re looking to learn more, I’d recommend Lauren Wittman’s "The Tomb of the Unknown Soldier, Modern Mourning, and the Reinvention of the Mystical Body." The Changing of the Guard being performed in front of the Tomb. The photo looks so static in part because of how rigid and controlled each movement is.